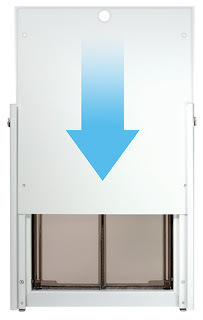 The PlexiDor Awning prevents rain, sun, snow, and wind from entering through a pet door. The awning is made from aluminum with a baked-on finish in white or bronze. Large / XL: 23 1/4″ wide x 16 5/8″ deep. On this picture, you see the awning outside an electronic PlexiDor. The PlexiDor Sliding Track System is another popular accessory. 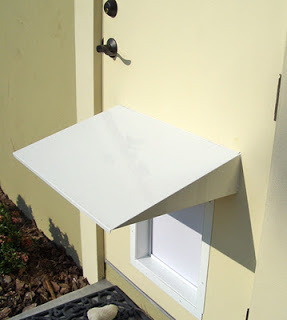 It’s great for people who attach the security plate often – many use it every evening, or whenever the door is locked, signaling to pets that the pet door is off limits. The Sliding Track system comes with all hardware and mounts to the inner frame in minutes. Then, the security plate slides down the track into place and does not need to be screwed on every time. A flip lock at the top ensures the plate stays in place.